It is my opinion that Nick Heidfeld is the most under-rated driver on the grid at present. He is so soft spoken and unassuming in his public comments, sticking always to the known facts and never indulging in flights of fancy, that he seems to get lost amongst the fuss and hype surrounding others. Last Sunday he was the quiet man throughout the race, plugging away honestly and steadily and getting yet another second place as his reward. Good for old Nick we say, fully expecting Kubica to blow him away again in the next few races. Do not be surprised if things go slightly differently from now on however. 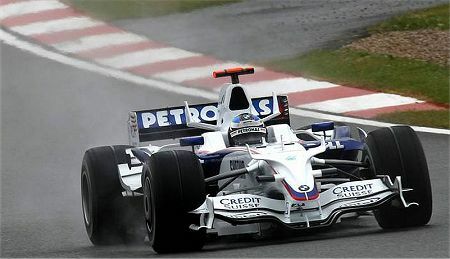 It is a pity that Kubica's car problems deprived us of the spectacle of the Beemer boys fighting it out for grid position because I suspect that Heidfeld has finally got the hang of qualifying the F1.08. If I am right, we are in for a treat as the two struggle to be closest to the stars in red and silver. The thing about Nick is that he races without drama but very effectively. We already grant that he is one of the hardest to pass but how often do we give him credit for his overtaking skills? That moment when he overtook Raikkonen and Kovalainen in one go at Silverstone was one to treasure, the move that ensured him of second place. Yet there was no drama, no fuss, he just drove the BMW through the gap that appeared, making it look easy and robbing the moment of its drama. There was the measure of the man - no last minute desperate dive for a closing gap, no muscling of an opponent out towards the grass, just the quick acceptance of an opportunity that no one else realized was there and then off into the distance. And that is Nick; if there is any reason why he is not already known as the John Watson of today, the great overtaker, it must be that he passes others with such apparent ease. All this was done in a car that even BMW admits is not quite as good as the Ferraris and McLarens. Nick kept it in contention, stayed on the road and took his chances when they came; he may not be dramatic but sheer consistency could still see him to a GP win this year. Who knows? The championship is not out of reach either. Robert Kubica is a useful yardstick when considering Heidfeld. In many ways, he is a totally different driver from Nick, all fire and passion where his team mate is a cool head. If Nick takes no risks, merely accepting the limits of his car and driving within them, Robert is the one to throw the beast around a bit, exploring to and beyond the limit. He, too, had a brilliant race on Sunday, hauling the car up to third spot before finally risking a bit too much and bogging down in the gravel. Like many that afternoon, he deserved better. What it amounts to is a finely balanced driving team, a perfect choice for the improving BMW. They spur each other to greater efforts yet, perhaps because of the realistic outlook implanted by Dr Theissen, they avoid the squabbles that affect other teams. And the BMW team continue to show the rest how it's done, avoiding the complex tactics of the others, just being as efficient as they can and allowing what comes of that to happen as it will. It was good to read, too, that the good doctor has stepped back from his earlier assertion that they would now concentrate their efforts on 2009. He is adjusting the development strategy to continue work on this year's car, aware that they must keep up the pressure on the top teams. That is absolutely necessary if Robert and Nick are to remain championship contenders. And so to the the mastermind, Ross Brawn of Honda. Don't ask me how he managed to get Barrichello on to that podium - it should not have been possible. The change to extreme wets helped a great deal, of course, leapfrogging Rubens to second place before his forced stop for fuel, but how on earth did he get the car high enough up the order to be in reach of the front runners when the heavy rain came? Rubens is known to be pretty good in the wet so that is part of it as well - but let us not forget that the Honda is a dog capable of beating only the Force Indias. Respect to both Barrichello and Brawn (and an oh well, maybe next time for Button). Honda are supposed to be directing all their efforts into next year's car so there is little prospect of any great improvement for the drivers to look forward to in the remaining races. Rubens' third spot will be something to remember and get them through the hard days ahead. Of course Ross played an important part of the strategic decisions (he at least agreed with Rubens calls), but most of the "blame" for the decisions are on Rubens. BTW, I've read here in Brazil that Nick Fry was quoted as saying that he will retain only the best of his two drivers for next year. I've searched the internet to see where did this come from, and I found this from sky sports: "As for next year, at the end of the day we'll choose the best two drivers.". I believe it was a lost in translation mistake from the brazilian press, but what do you think about it? Do you think that Honda is capable of dumping Jenson and keeping Barrichelo for 2009? I never though about it before, but it makes some sense for me now. Both Rubens and Jenson are similar drivers IMHO. And, let's be honest, neither of them have a bright and long future in F1. So what makes sense for is Honda getting a youger driver who can learn from a more experienced driver and lead the team in 2010 or 2011. To me, Rubens would make a better job in that role than Jenson. What is your opinion? Thanks for that, Felipe - I hadn't realized that Rubens had so much part to play in the timing of the pit stops. As to who will drive for Honda next year, that's a difficult one. I can see the team letting one of the present two go but must admit I doubt it will be Jenson. Although there is not much to choose between them, the fact that Barrichello must be near retirement has to be a major consideration. And if they look for a young, talented driver, who is there? Unless one of the other teams surprises everyone by letting go of one of their new stars, there's very little on offer. There are rumors of Alonso being interested but I think he'd be mad to go from a team that supports him as much as Renault does to a Honda whose future competitiveness is very questionable. Brawn may be good but he can only do a certain amount to compensate for a car that is not capable of winning GPs. So I think the most likely scenario is that both Button and Barrichello will stay on and Brawn will be looking carefully at new drivers in GP2, hoping to find someone special for 2010. Up until today, I had the same feeling about who will drive for Honda next year: Button and probably Barrichello. Now I think that the probability of Honda sacking Rubens is almost the same of sacking Jenson. But I agree with you that the most likely scenario for next year is RB and JB staying on. Next year Honda will get Petrobras (the brazilian petrol company) sponsorship, fuel and lubes. Petrobras will leave Williams after 10 years of partnership at the end of 2008. So I can see some sort of "brazilian drivers encouragement" from Petrobras towards Honda. One rumour that is growing strong here in Brazil is that Bruno Senna could go to Honda next year. I personally still believe that if Bruno Senna starts his F1 career next year, it will be with Toro Rosso. Back to Heidfeld, I think thats what I like most about him. He is not a drama queen ! He just rolls his sleeves up and gets out there and does the job. I really hope we see him on the top step of the podium this year. As regards to Honda, well I have long thought that Jenson is vastly overrated as a driver, but that may just be the James Allen effect. I definately find I am liking Jenson more now that Allen has shut up about him, but am still yet to be convinced that he is all he is cracked up to be. And after the Williams/Honda contract fiasco I doubt that any team other than Honda would take him on. If I were Brawn and looking to replace drivers I'd be looking in Jenson's direction rather than Rubens, and providing Alonso has not signed with Ferrari I'd be looking in Fernando's direction too. I've been a fan of Nick for quite a while and try to keep track of him during the weekends, but it's hard to do. He's never front and center, never creating controversy, but just trying hard to get his job done. I have hoped he would get to grips with the F1.08 and when he did for that race, it was great that we could finally see his skill. I hope this one race wasn't a fluke and that he continues. I also hope he stays at BMW-Sauber. As you say, they just quietly get their business done and suddenly appear. That appears to be a good fit for Nick who would rather study telemetry than appear on camera. I was ecstatic to see Rubens on the podium and was cheering him on as he moved up. He's a guy who really deserves the opportunity to mix it up a bit even though he's in the twilight of his career. The fact that a lot of the decisions were his shows just how smart a driver he still is. Felipe: Very interesting, that about Petrobras - and something to remember when considering the driver market for next year. Bruno Senna and Romain Grosjean are the most likely new entrants to F1 next year and rumours are already starting about which team is going to snap them up. Peril: Ah, Jenson, Jenson, Jenson. I have been in two minds over the guy for so long now that it feels almost a natural state. If only someone would drop a really good car and we could see, once and for all, whether he has what it takes or not. If Honda want to try a different driver next year, they have an unenviable choice to make - who to drop, Button or Barrichello? Heidfeld drove a great race on Sunday and never looked like overstepping the mark. If Honda are going to sign a young driver for next season my money would be on Mike Conway. He has been on their young driver program for a few years and is a very capable driver. Clive, I couldn't agree more with your assessment of Heidfeld, who has driven consistently brilliantly for a number of years. His pre-F1 career was stellar and he was desperately unlucky to be overlooked by McLaren in favour of Raikonnen who, to all intents and purposes, he had (just) had the beating of at Sauber. His season got back on the rails (almost unnoticed) at Magny Cours, when he qualified within a few thousandths of Kubica. His race pace has not been in doubt all season and, now that he seems to have found a way of generating the necessary temperatures in his front tyres for qualifying, I very much expect his results to improve in the second half of the year. He is an incredible wheel-to-wheel racer - something that is not often noted, and I'm glad you pointed it out. He puts me in mind of a comment Rob Walker once made about Alain Prost: 'when he passes someone, it's never messy; it reminds me of ballet'. The most striking example of this is to watch the footage of Monaco 2005. Late in the race, as Alonso's rear tyres disintegrated, the Williams' of Nick and Mark Webber caught him quickly. Nick's move on the Renault, down the inside at the seafront chicane was incisive, neat, quick and stuck first time. Webber took two attempts, and - in contrast - made a desperate, locked up, slithering, last gasp dive that was literally inches from ending in disaster. That's by no means meant to show Webber up as being a bad racer (I think he is excellent), but to highlight the sheer quality of Nick's feel and judgement. A great driver - and definitely the most underrated on the grid.